Camboard Computer Explorer is an educational tool useful for learning computer science. Explore the inside of a virtual computer, without removing the case with this computer science software from Camboard. Computer Explorer lets you see inside a computer and zoom and pan round the parts of a computer. The computer system is shown in 3D. You can zoom in and pan round the system. Shows the keyboard mouse and monitor. You can see how a computer works with Camboard computer science software. Includes a virtual computer tower with all the parts of a computer. Click on a computer part and a description is displayed of what the part does. A great tool for learning computer science. Wosrt piece of software I ever got from SharewareOnSale. Screen just shows a phontom view of a computer. Nothing else. Useless! To check the exact PC hardware specs, the traditional way is to open up the PC case and take a look inside at each component. With new and advanced softwares, nowadays, the specs can be checked easily using the application without having to open the PC case. But many of these softwares, do not work really well. There are a few softwares, which actually let you view the computer components as 3-D model on the screen. Camboard Computer Explorer is an educational tool, that let’s you inside your computer without the need of removing the case. It let’s you zoom and pan around computer parts and view them and know what the part does. The installer size is ~5MB and it comes in a zip file which needs to be extracted to get to the actual setup file. Once you run the setup, the installation process is simple and straightforward taking no time at all to complete. After running it for the first time, the application asks you to enter the serial number to activate the application for use. 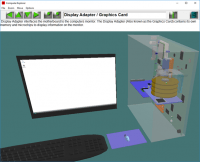 Once done, the application launches and displays you the 3-D model of your machine. For the application to function and run your PC needs to have DirectX 8.1 or higher installed. Newer versions of Windows don’t need to worry about that as all the required components are pre-installed. The UI of the application is clean and simple, and should not be a problem to use for all types of users even the novices. There is a menu bar on the top with drop down menus, followed by a toolbar that contains buttons to move left, right, up, down, zoom in, zoom out, info, and a button to exit the application. The 3-D model can be rotated, panned, zoomed, and you can click on the component you want to know about. A description appears on top, telling you what’s the function of the component. A window on the top shows the name of the component too. The background color of the area where model is shown can be changed and adjusted to the user preference. – Easy to use and clean UI designed to be suitable for all types of users. – Ability to view computer hardware components without the need to remove the case. – View description and the purpose of the selected component. – Background color can be changed. – Labels that appear when you hover over a button are wrong, exit button says zoom in. – Stutters and lags when rotating or zooming in and out. – Back color change never works, even after restarting the application. – The visuals of the UI are not that great and appealing to the eyes. – It shows hardware components of only one computer it is installed on, other similar tools have capability to view hardware of multiple computers in the same network. 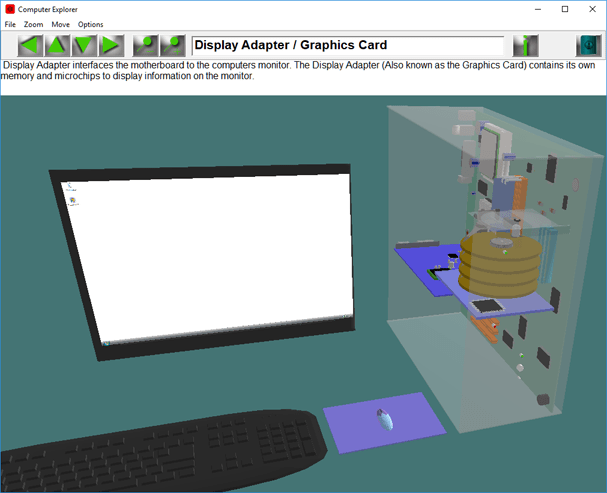 Camboard Computer Explorer is a tool, that can help you view PC components in a 3-D virtual form. This can be great to be used for educational purposes, as you do not need to open up a PC to view those parts. It shows description and function of each individual parts which is great for learners.